Typical council tax bills in England will rise by 4.7% in April - the second biggest increase in a decade, official figures show. In Wales, the average rise will be about 6.5%, for example in Cardiff - the largest council in Wales - leaders set an increase of 4.9% while Pembrokeshire saw a 9.92% rise and Conwy 9.6%. 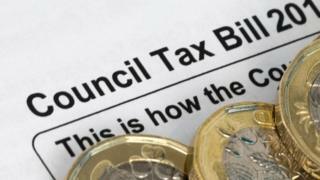 Taxpayers in Scotland will see council tax on typical Band D properties rise by an average of 3.9% to £1,243. More rural areas, described as "shire" areas, will see the biggest typical rise - up £82 to £1,826 for a Band D property. Councillor Nick Rushton, County Councils Network finance spokesman and leader of Leicestershire County Council, said: "For a long time, county residents have borne the brunt of the historic underfunding of county areas. It cannot be fair that a resident in a terraced home in Hinkley in Leicestershire is paying double that of a resident in a multi-million-pound house in Westminster. "No-one wants to put up council tax, but many of us have very little option with county authorities facing the most severe financial pressures." But higher bills do not necessarily mean a boost to local services. The funding central government gives local authorities will have fallen by almost 60% this decade. Even with the latest increase, the Local Government Association is warning of a funding "gap" of £7.8bn by 2025, which could put further pressure on services.